Our walk through life changes us. Dealing with challenges, change and criticism opens our eyes to varying perspectives of our struggles, and we may outgrow certain relationships that once thrived. For some friends, we felt a special connection, yet now, we feel so far away. Our paths have led us in different directions; our perspectives have changed. Perhaps we don’t recognize ourselves, perhaps we don’t recognize those friends. Whatever the case and whatever the cause, choose to lovingly remember the shared closeness and gracefully accept what may no longer be productive or healthy for your life. I believe in the inherent good of others; I also believe that our journeys change how we experience life and one another. What may have worked for a season, may no longer have a place in our life. And that’s okay. Consider it carefully and do what you know, in your heart, to be right. 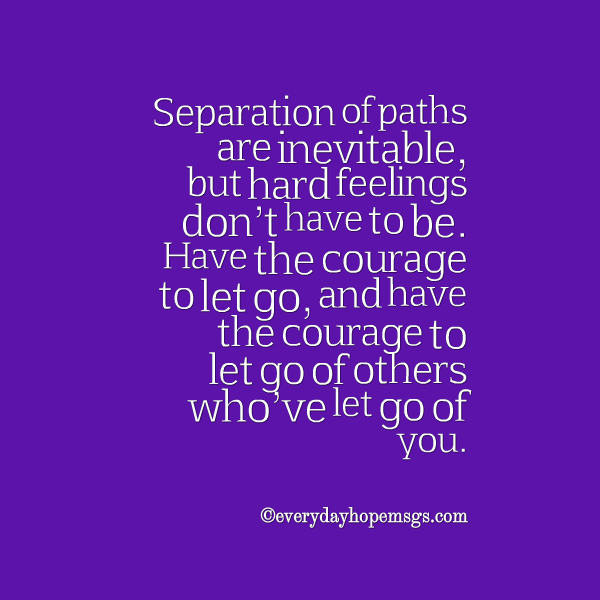 Separation of paths are inevitable, but hard feelings don’t have to be. Have the courage to let go, and have the courage to let go of others who’ve let go of you. You’ll free yourself from pain that will gradually erode your heart without your consent; you’ll free yourself from bitterness. Not everything unfolds according to our expectations, and that is part of life’s mysterious beauty. Every “no” is preparing us for a far greater “yes.” Have the courage to embrace life’s seasons, as they come, and embrace the graceful ability to let go. Did you like this Every Day Hope Message? Get your daily dose of inspiration, delivered right to your inbox – sign up at: http://everydayhopemsgs.com/subscribe/ and receive a free instant download of my eBook, Days of Hope: 72 Inspirational Messages Designed to Start Your Day Right. Enter the coupon code HOPE at checkout to receive $5 off your subscription.